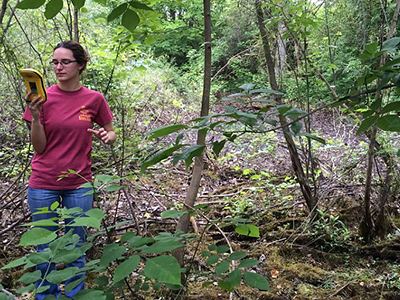 GAC intern, Steph Bosch, collects GPS data for land cover mapping of Rush Run Natural Area in southwestern Ohio. The GAC project room contains 2 high-end computers dedicated to GAC research, contracts, and projects. This project room is capable of being secured and of storing sensitive data. This room is can be used for on-site or remote meetings. The GAC also has access to the Department of Geography's two 26-seat computer labs. All machines have the latest GIS and Remote Sensing software installed.